Ann Bridgeforth moved with her family from Chicago to Mount Clemens in the late fifties. 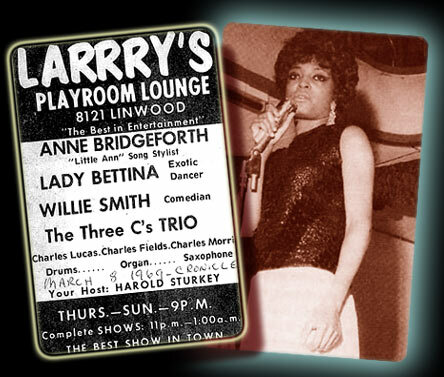 Born and bred a singer, she sang at her cousin's club, Michelle's Playroom. As she picked up on gigs, she changed her name to Little Ann. This was her family's pet name due to her being the youngest of seven brothers and sisters. She was taken to Dave Hamilton's TCB studio on Highland by a guy named Eddie Grace. Hamilton would record songs and lease them to other companies and "Going down a one way street", Ric-Tic142 was one of them. Apparently when they took the song to Wingate he demanded they change the lyrics and the arrangements. He also put an instrumental on the flip side. Sadly this was Little Ann's only foray on vinyl and she thought that her career was over. In the early eighties an acetate was uncovered by someone in England. The song was dubbed "When he's not around" by Rose Valentine and it became a monster on the Northern Soul scene. A visit to the home of Dave Hamilton in 1990 by Gilly from England, led to the chance discovery of the song on a master tape. It was actually by Little Ann and called "What should I do?". This magical song eventually gained release in the UK on a CD of Dave's work by Ace/Kent records. Thirty five years after launching her career, she appeared on stage in England, to the type of adulation she would have dreamt about as a child. Sadly, Ann died in February 2003. I am indebted to Ady Croasdell of Ace/Kent records for the above information.